Auto Industry Newsletter: Is this new 4x4 a 4x4 too far? A new company, Ineos Automotive has been formed to manufacture a rugged off-roader in the style of Land Rover’s discontinued Defender, according to Jim Ratcliffe who runs the Ineos Group. Ratcliffe, who allegedly made his fortune with the Ineos chemicals company but is known for his interest in the automotive sector and is a fan of the Defender, is understood to be considering manufacturing such a vehicle. Ratcliffe claims he sees a gap in the market when the Defender went out of production last year with JaguarLandRover (JLR) not set to introduce a replacement until 2018 or 2019. Rumours have been circulating since last summer that Ineos had been considering a move into the automotive sector, though the company has been tight-lipped about its plans. The vision of rich pickings from a specialised sector of the market, in the way laid out by Aston Martin, and maybe TVR – two luxury car makers on the verge of new greenfield manufacturing sites – could prove tempting. Others have been down this road, like Allan Amey, who took over Leyland Daf Vans to create LDV springs to mind. Amey hoped to create what were, in effect, niche van products with added value and take market share from Ford Motor Company. But LDV disappeared, swallowed by Russia’s GAZ. Others spring to mind David Brown who tried to pump life into Aston Martin; and another David John Bowes Brown who tried to take breathe life into Bedford, recreating a new brand in the process. Brown’s barand – AWD or all-wheel drive – also faktered. Both men had deep pockets behind them. Ratcliffe is starting from scratch; Amey did have a working template; a facility and a workforce. Likewise David Brown and David Brown had both facilities and a workforce in place. Both of these Browns had deep pockets – but not deep enough to weather the automotive industry’s storms. Starting from scratch requires very deep pockets, motivation and persistence. Look how long it had taken Torotrak to achieve a breakthrough – and it still has to make it after all these years. And across the Atlantic and in China, efforts are being being to bring new opposed-piston engines to market against huge odds. Ineos has confirmed it expects to spend “hundreds of millions” on the plan, which will move the company into a new sector. But hundreds may not be enough and sight must not be lost of ‘returns on investment’ amidst the yearning to fill an apparent gap in the market. Can the market be grown? And at what cost? Ineos says it has completed a six-month feasibility study into the project and believes it is viable. It hopes that the new car could be built in the UK, potentially creating 1,000 jobs in a new factory. Calling it a “fantastically exciting project”, Ratcliffe - allegedly one of the UK's richest men - said he wanted to “build the world’s purest 4x4 and we are aiming at explorers, farmers and off-road enthusiasts across the world”. The new vehicle will not be a replica of the Defender but will “reflect its philosophy” according to Ineos, which claims the car will “offer a real and pure alternative to the current crop of standardised jelly-mould SUVs”. Tom Crotty, a director at Ineos, said the company envisages a market in the "tens of thousands, not hundreds" per year for the new car and that building it Britain would be an important selling feature. But 20,000 is 400 a week or 80 a day; 10 an hour. Such numbers require a decent production line with automation. "Having Made in Britain would add a certain cachet but we have to be realistic," he said. "We want to build this but we are not going to die in a ditch over the location." Building a factory and getting design work would mean that the first vehicles would not be ready until 2020, According to Crotty. This would be one year after the launch of JLRs new a defender. According to Crotty, pricing expecting to be around the same level as the old Defender - which cost around £25,000 for an entry-level model. It is claimed that producing a vehicle as a ‘new’ Defender is not a vanity project for Ratcliffe, and the company sees a real market opportunity, according to Crotty. "It's a massive undertaking but we believe we are pretty good at big projects," he said. "We've just spent $2 billion on a project that allows us to import gas from the other side of the world." Ineos has appointed Dirk Heilmann, the company’s former head of engineering and technology, to lead the newly formed Ineos Automotive, which is now recruiting ‘experts’ from the car industry. JaguarLandRover is protective of the Defender brand and last year stopped a Canadian company using the name for an off-roader it launched. Just how far the project will go remains to be seen with the car industry working on notoriously low margins. Professor David Bailey, an automotive industry specialist at Aston University, said: "There could be a small market opportunity but there is a lot of competition. 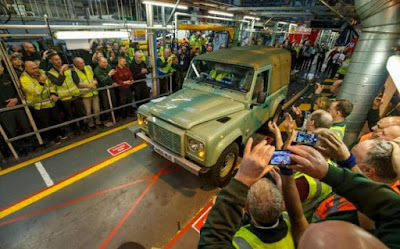 "When JLR closed the Solihull Defender production line (above), which was too small, it started restoring old Defenders and selling them and is probably making more money on those than it did on new ones." He also highlighted the challenges of making a car from scratch that will meet motorists' expectations. "People underestimate just how hard it is to build a car which has the reliability we have come to expect and is also cutting edge," Prof Bailey said. "But then there are some niche sports car manufacturers building a handful of cars for die-hard enthusiasts and maybe this car could find the same sort of market." As part of this is the rigorous homologation and safety requirements which will come after the new engineering team have designed the chassis and selected the powertrain. part of vehicle engineering and design, as well as cost analysis. The powertrain alone is a major hurdle. Is Ford’s Dagenham Engine Plant likely to be a source of supply? And will JLR executives have a view about this? COMMENT. Land Rover’s Defender is such an iconic brand, not only in the context of its large and multifarious world-wide following, but because of the longevity of the product. Added to which, the product appears to be able to command a high price in the market. Ladder-frame construction makes the vehicle ideal for cross-country work, not only by the farming community but by electricity, gas, pipeline, construction and other activities which need a rugged cross-country vehicle. Manufacturing processes likewise are simple, straightforward and well-honed. It does seems surprising that at least one member of JLR’s board has not reacted before now to putting up a proposal to produce the ‘outgoing’ vehicle on a modest scale. There are so many empty warehouses in the Coventry and Birmingham areas just waiting for occupation. It would not take much by way of a management decision to give the green light and say: "Let's continue to make the vehicle ourselves in the UK, but off-site." Top management ought to be able to see the management training opportunities associated with setting up a small, tightly knit group of JLR people, free to recruit new and existing shop floor staff and introduce apprentice training. All the shopfloor expertise is in house and ready and willing to be drawn upon. The production line, stored in a warehouse, could be revitalized quickly and an SOP date fixed. Issolated from JLR's hierarchy thinking, the new team would be free to energize their ‘can-do’ mentality to create a self-standing business and earn themselves a distinction. The product already commands a high price in the market place born of the brand’s reputation. It would not be difficult to create a tiny, but pro-active profit centre which besides offering valuable opportunities for management training would at the same time protect the brand’s image, making it difficult for outsiders to crowd into a market that is basically Land Rover’s by right. It is to be hoped that the Ineos 4x4 does not inherit the Defender's reputation of being easy to steal. Since the announcement of the rugged Land-Rover's demise, thefts of Defenders have soared. They are wanted for their parts, the supply of which, in the bona fide aftermarket, is obviously threatened. Another hope is that Ineos achieves the level of product quality expected in a sector where the likes of Toyota (with the more basic Land Cruiser) and Mercedes (with its Austrian-built G-wagen) are potential competitors. Otherwise Ineos director Tom Crotty stands the risk of being christened 'Tom Grotty' - at least by satirical UK magazine 'Private Eye'.